Grilling is great all year long, but my absolute favorite time to grill is on Sunday nights in the summer. That said, I still don't want to spend too much time away from the pool, hovering over the grill, so I like to keep it simple. My favorite summer dinner is steak, corn, and mac and cheese, and when you want all of that, you need to plan your time accordingly. Here's one of my secret tips: get premade mac and cheese from the deli section at the grocery store and spice it up with a few add-ins. I added cooked, crumbled bacon and tomatoes to mine, but you can use whatever you prefer. Ham and green onions or ground beef and tomatoes would be great and are super kid-friendly too. Prepare the grill for two-zone grilling, this way you can get multiple dishes going at the same time and keep the food warm until it's time to eat. Start by spreading a little butter in the Weber Deluxe Pan Set. Pour in the mac and cheese and place the pan over indirect heat. It's already cooked, you're only heating it up, so indirect heat is the place to be. 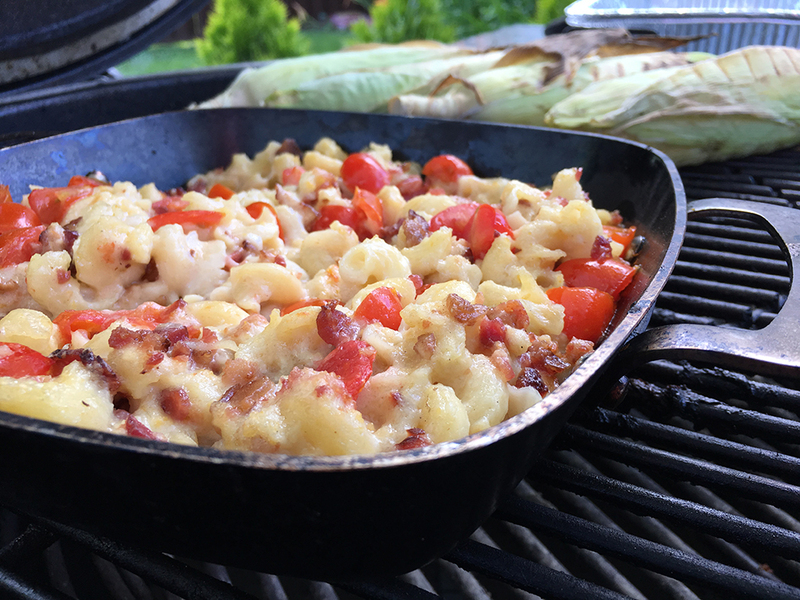 The mac and cheese will heat up while you grill your corn over direct heat on the other side. 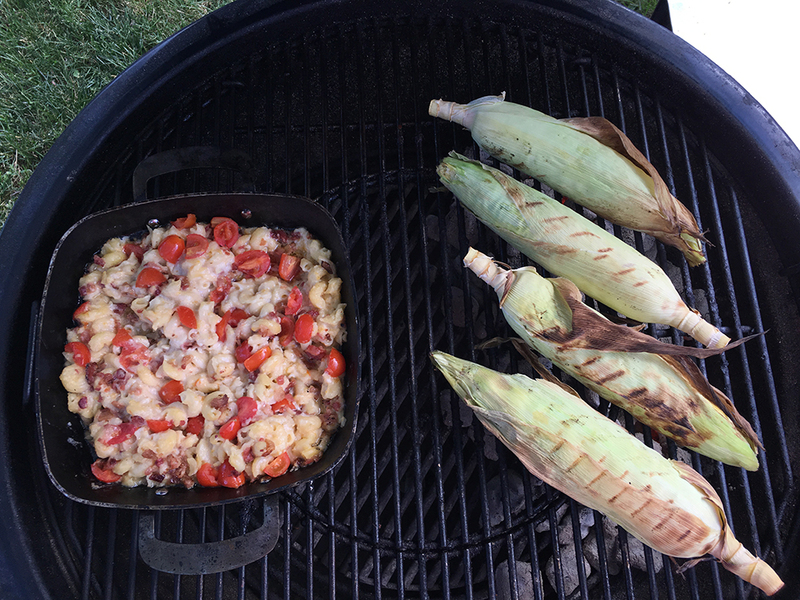 Here are some great tips and recipes for grilling corn on the cob. When the corn is done, move it to the indirect heat side to keep it warm and get ready to grill your steak! This Sunday I used a thick bone-in ribeye, and wanted to try something different, so I attempted the reverse sear. The reverse sear helps you achieve a nice, crispy crust and an even, warm, pink center. I inserted my probe for the iGrill, and placed the steak on the indirect side to begin cooking. 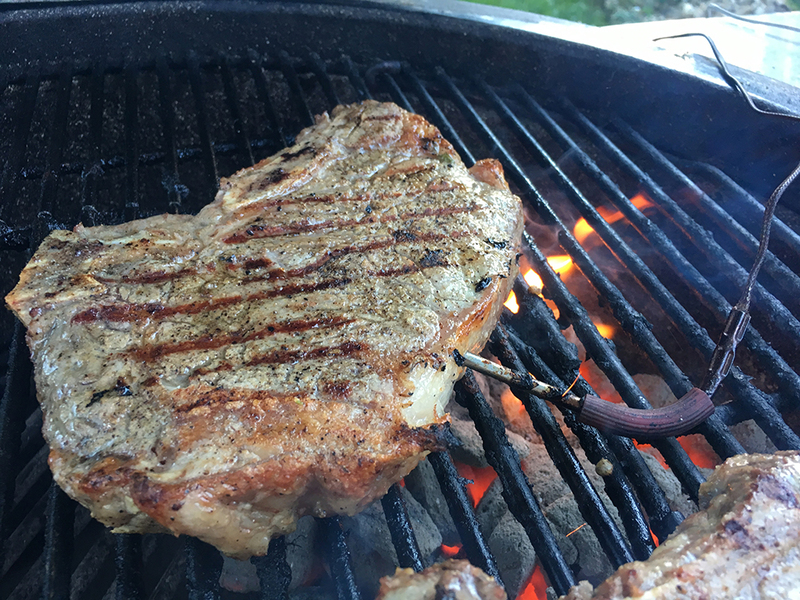 Once the internal temperature was about 10˚ away from being finished, I quickly seared it on the direct side for about one minute per side. Now everything is warm and ready to eat (preferably outside sitting next to a swimming pool!) at the same time!